Receivers and kick returners need as much practice as anyone else on the team. Unfortunately, because there are only so many throws a quarterback or coach can get in during a practice and with multiple players to throw to, nobody ever gets as many balls thrown to them as they really want. Time restraints prevent kick returners from fielding nearly enough balls, too! Then, there is the problem of wearing out the arm of the coach or QB by throwing multiple long balls. The First Pitch Quarterback Football Throwing Machine takes care of both of those things! Not only can the First Pitch Quarterback throw, but a simple slide adjustment sets it into kicking mode. In throwing mode, the First Pitch Quarterback can launch a perfect spiral up to 80 yards - further than almost any quarterback can throw. It also can boot perfect end over end kicks 80 yards (a coach's dream). A dial adjustment lets you to set the throw or kick to whatever distance you want. Easy tilt and height adjustment allow you to set the arc and direction, as well. The First Pitch Quarterback football throwing and kicking machine is simply the best machine of its kind for the money! 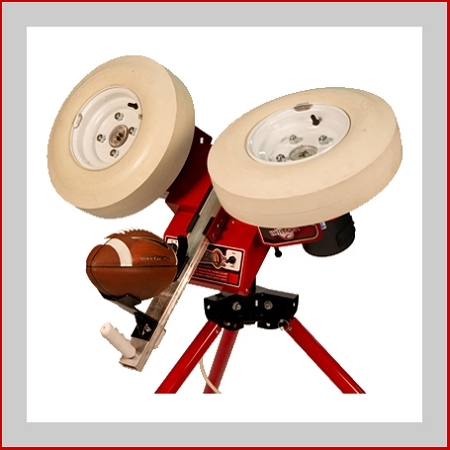 Made entirely in the USA, the First Pitch Quarterback Football machine is made of steel and features twin 1/3 horsepower motors that is powered by any standard 110 volt electrical outlet. Like all First Pitch machines, it features a 5 Year Warranty, a 14 day Satisfaction Guarantee and ships free to the continental USA when you order it from Pitching Machine Stop. I could not have asked for anything more. I have a very limited amount of time on this machine as of now but the construction is top notch and seems very durable. It is heavy so have an extra set of hands available when setting up. It took me about an hour from start to throwing balls. The limited instructions were actually all you need to get going so why over think it. I used a full size synthetic ball that fed perfect and kept a tight spiral. I fed close to 200 passes the first night and didn't have a single hiccup. Thank you for a quality well thought machine. We really like this machine. It took me about 30 mins to get it to throw 30 yards spirals. We use youth size composite rubber footballs. We tilted each wheel 10 degrees with the right side pointing down and left side pointing up. I used my cellphone and a bubble level app to find 0 degree (flat) and 10 degree tilt angles. Q: Wanting to make sure this is the tall version of your machine listed at this price? A: There is only one version of this football machine made. It comes with the standard adjustable legs. A: This machine can only throw footballs. The wheel gap is not adjustable, making it impossible to set it at the small diameter necessary to throw baseballs. There is no machine that I know of that can throw both footballs and baseballs/softballs. To ensure your satisfaction, the First Pitch Quarterback football machine includes a 14 Day Money Back Satisfaction Guarantee. Returned items must be in good, resellable, "like new" condition with original packaging. Unless returning an item that is defective, customers are responsible for the return shipping costs to First Pitch as well as the original actual shipping costs, whether they obtained "free" shipping or not. There is also a 10% restocking fee on all returned items. First Pitch warrants the operability of your football machine for 5 full years for residential use or for 1 full year for commercial use from the date of purchase. This warranty covers all mechanical and electrical parts against premature wear or failure, electrical malfunction, or accidental damage during reasonable normal use. 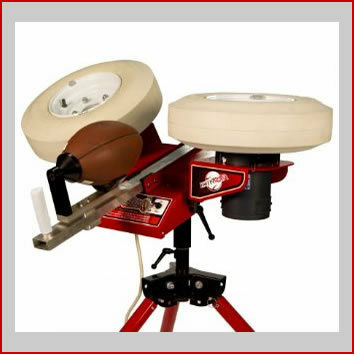 No matter where you order a First Pitch Football Pitching Machine from, NOBODY actually stocks them; they all ship directly from the manufacturer's warehouse located in Maple Plain, Minnesota. Therefore, the shipping time frame is exactly the same no matter what website you order from (we hope that it is this one!). First Pitch Football Throwing Machines typically take 3-5 business days to ship from the time you place your order. They ship via Federal Express (FedEx) Ground and could take anywhere from a day or two to a week to get to you AFTER being shipped, depending on your proximity to their warehouse. We will notify you of your tracking number the moment we receive it from the manufacturer's warehouse. Click here to download an easy to read, printable PDF of the First Pitch Quarterback Instructions. Click here to download an easy to read, printable PDF of the First Pitch Quarterback Operating Tips.